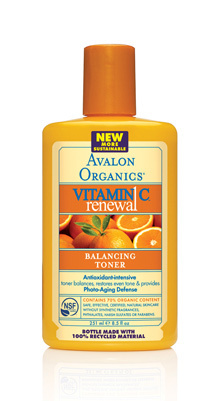 AVALON ORGANICS SKIN NOURISHING ANTIOXIDANT INTENSIVE VITAMIN C SUN-AGING DEFENSE BALANCING FACIAL TONER. CLARIFIES, TONES, AND HYDRATES PLUS ANTIOXIDANT PROTECTION For All Skin Types. SAFE, EFFECTIVE, PRO-ORGANIC SKIN CARE WITHOUT ARTIFICIAL COLORS, SYNTHETIC FRAGRANCES OR PAPABENS. EU COMPLIANT. TO USE After cleansing, dampen a cotton pad with toner and gently wipe face and neck. Follow with your favorite moisturizer, pH Balanced. Organic lavandula angustifolia(lavender),chamomilla recutita(chamomile), camellia sinensis(white tea) and organic arnica montana extracts(aqueous), organic aloe barbadensis, panthenol (pro-vitamin B5), magnesium ascorbyl phosphate(vitamin C), melatonin, lemon bioflavonoids, organic cucumis sativus(cucumber) and calendula officinalis extracts, allantoin, vegetable glycerin, sodium PCA, citric acid, salicylic acid, hydrogenated castor oil, echinacea purpurea, ginkgo biloba, camellia sinensis (green tea) and carica papaya fruit extracts, phenoxyethanol, ethylhexylglycerin, benzyl alcohol, organic citrus auratium dulcis(orange) oil and other essential oils. 1) Certified by Oregon Tilth 2) Certified by Quality Assurance International 3) Certified by Pro-Cert Organic Systems 100% VEGETARIAN INGREDIENTS, NO ANIMAL TESTING. PARABEN FREE. EU COMPLIANT.